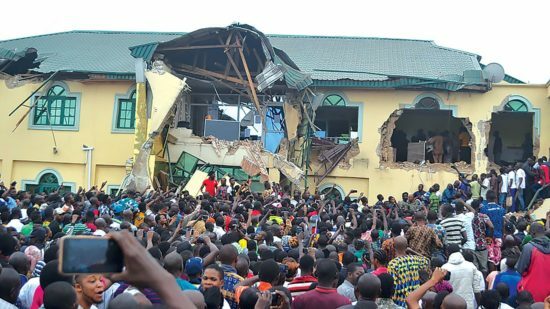 The Oyo state government has released a statement detailing all the faults of the demolished music house owned by gospel singer, Yinka Ayefele. According to the statement released by the Special Adviser, Physical Planning and Development Control to the state governor, Abiola Ajimobi, Tpl Waheed Gbadamosi, the building occupied more land than was approved, had a radio mast which was not in the approval issued, toilets, also kitchen were built on the wall of the building and many others. 1. 19th May, 2017, letters demanding for planning approval were sent to various institutions including UCH, Kola Daisi University, University of Ibadan and other institutions and organisatons. 2. 14th June 2017, request for approval was sent to Music House and 22 other radio stations in Oyo State. 3. 18th August 2017, Reminder Letter was sent Music House and the letter was received by Adebisi Akinkunmi. 4. 25th August 2017 A letter was sent to National Broadcasting Commission titled Operation of Radio Stations without Physical Planning permit/Aprroval in Oyo State. 5. November 27, 2017: another letter was sent to NBC complaining about Physical Planning Law and Regulations by the Radio station owners, developers and operators. 7. 14th June 2018: an approved building plan was submitted and BPP& DC discovered that it was meant to be an office complex and not a radio station. 8. June 25th 2018: A joint visit was consequently carried out by the officials of the Bureau with Music House officials. b. The building has encroached into the sight distance of the Y junction along Lagelu Estate. 10. June 29, 2018: letter was sent to Music house to come and regularize its building plan. 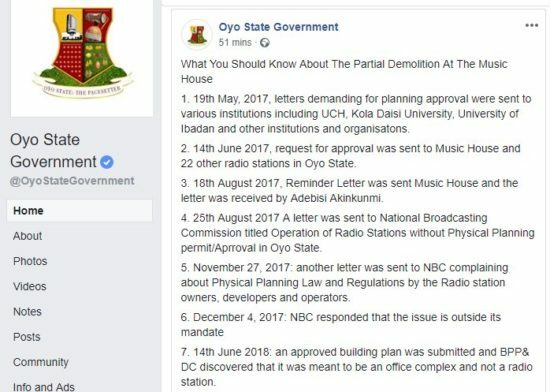 0 Response to "Oyo State Government List The Faults Of Singer Yinka Ayefele’s Demolished Station"